Steve Sax motivates and inspires with real life examples elevating your team to new levels. Steve is an ICF Certified Coach and no stranger to success. Named 1982 Rookie of The Year, 5 Time All Star and 2 time World Series Champion, he understands what it takes to be great. True sustainable success--at work or at home--is a habit, natural and unstoppable. It all starts with that person staring back at you in the mirror! Everyone has the tools within to impart positive change. Ultimately, success is a choice, a deliberate and methodical choice made every single day. It all starts with a SHIFT in the way you view your world. True sustainable success–at work or at home–is a habit, natural and unstoppable. It all starts with that person staring back at you in the mirror! Everyone has the tools within to impart positive change. In coaching with Steve, results are what counts! The Co-Active method ensures that you are the master of thought, the molder of your character and the shaper of your own destiny. Steve's goal is to help you navigate the course and put you on a path to success. Your track is already built, through coaching you will find it and begin to run on it. Success is built on a series of small conquests that over time build up a momentum that takes on a life of its own. Its not about grandiose fashion sometimes - it's about being pretty good everyday. Mounting positives soon becomes an Inertia of Positivity. You are one defining decision away from leading a totally different life. Decide to be a difference maker. Our minds need a target at which to shoot. If not, it will wander aimlessly and eventually go back to its old habits. The purpose of both empowerment and engagement is to capture a more effective contribution from the employees than would usually be expected. Creative change starts with an adoption of purpose-a desire to plant your flag and never move it. If we are going to improve our circumstances, we must first be willing to improve ourselves. Steve Sax is an exceptional leadership development coach whom I would highly recommend. Steve uses his many years of sports and business experiences, to help encourage, motivate, teach, and challenge one to go to the next level. No matter what field you are in, Steve has the God-given gifts to help further your development and growth. My personal and professional life have only been enhanced and bolstered through his coaching. My church is growing, and enthusiasm is high. So much of that I owe to how Steve helped change my outlook, attitude, and actions. If you want to develop the leader within you- contact Steve! True sustainable success is a habit, natural and unstoppable. What are your teams habits? Talk to Steve. In 2001, realizing that he had accomplished his professional baseball aspiration; he rededicated his talents to helping individuals and families to manage their finances as Vice President of Investments for the Royal Bank of Canada. 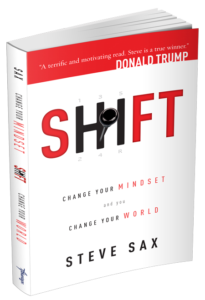 Steve is the author of the book SHIFT, a motivational and inspirational book that outlines action steps to change your mindset and to become a success. Shift is endorsed by Donald Trump, president of The United States. Let’s have a conversation about your needs, goals and priorities, and to see whether we are a good fit to work together. Empowering people to find their own answers while encouraging and supporting along the path of life-changing choices.